Fountain of the Sun is an established 55+ community in Mesa, Arizona. 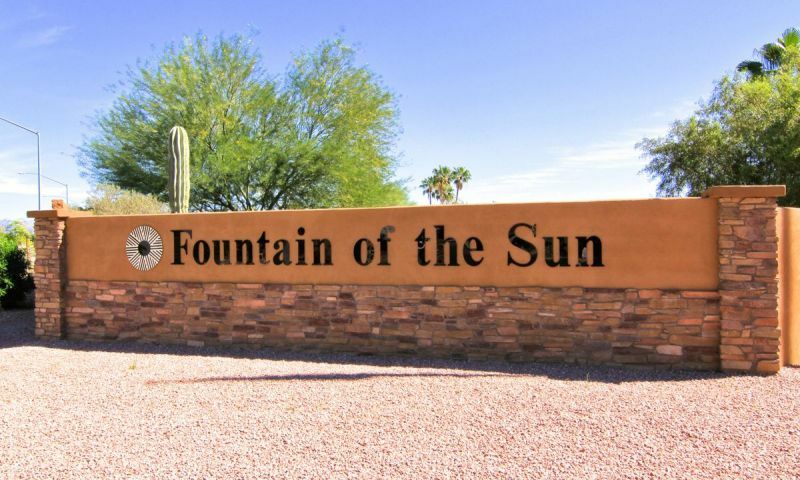 Located about 30 miles away from Phoenix, Fountain of the Sun sits on 582 scenic acres. This gated golf course community offers the ultimate in low-maintenance homes with a variety of styles and sizes at an affordable price. Homeowners within this great active adult community have more time to enjoy all of the fabulous indoor and outdoor amenities. With over 50 activities, clubs, and classes Fountain of the Sun s residents never run out of things to do. The clubhouse is the central hub of Fountain of the Sun s social scene. This well-appointed activity center provides social and fitness activities throughout the year. Fountain of the Sun s clubhouse has everything needed for today s active adult with a ballroom, multi-purpose rooms, game rooms, and a library. Staying fit is made simple with an outdoor pool and fully equipped exercise room. Homeowners often take advantage of Southern Arizona s mild climate by joining in on friendly completion at the four horseshoe pits and six shuffleboard courts. There is even a post office and pickleball court located on the grounds. Separate amenities can be found at the Fountain of the Sun Country Club a private, members-only golf and country club. Many membership options are available ranging from seasonal to social packages. The 18-hole executive course is perfect for golf enthusiasts of all skill levels. Members of Fountain of the Sun Country Club have access to its clubhouse which includes a restaurant, meeting rooms, and pro shop. UDC began development of Fountain of the Sun in 1975. In 1987 the community was completed with 2,296 residences. There are a variety of affordable low-maintenance home types available on a resale basis. Manufactured homes offer approximately 1,100 to 1,900 square feet of living space with two or three bedrooms, two bathrooms, and an attached garage or covered carport. Many attached homes offer less than 1,000 to 1,500 square feet of living space with one or two bedrooms, one to two bathrooms, and an attached garage. Single-family homes range from approximately 1,220 to 2,100 square feet and are the perfect option for homebuyers looking for a more private residence. Fountain of the Sun s single-family homes offer two or three bedrooms, two to three bathrooms, and an attached garage. Fountain of the Sun offers the best in low-maintenance living. Active adults and retirees have more time to enjoy the variety of amenities and activities throughout the community. Arts and crafts clubs often meet to sew, knit, or create ceramics and stained glass. Golf leagues, water aerobics, softball teams, yoga, and Pilates are some of the popular sport-focused groups and exercise classes that meet on a regular basis. Getting to know your neighbor and making lifelong friends is easy with many social activities that include bridge, bible study, chorus, dances, improv, swap meets, poker and more. Whether you want to focus on social or physical activities, you ll be sure to find a club or class that sparks your interest. Fountain of the Sun is located in Mesa, Arizona northwest of Red Mountain and Superstition Freeways. Its convenient location near Route 202 (Superstition Freeway) makes Phoenix Sky Harbor International Airport and downtown Phoenix just 30 minutes away. Residents are about a ten-minute drive away from Superstition Springs Mall and major medical facilities at Banner Hospital. Mesa is a vibrant city that is packed with educational, cultural, and outdoor attractions. Downtown Mesa is home to the Arizona Museum of Natural History and many restaurants. With easy access to farther attractions in Phoenix and plenty to do locally in Mesa, Fountain of the Sun is a wonderful community for active adults and retirees. All residents have full access to Fountain of the Sun's main clubhouse and its amenities. Fountain of the Sun Country Club is a private, members-only golf and country club. There are many membership options available. There are plenty of activities available in Fountain of the Sun. Here is a sample of some of the clubs, activities and classes offered here. There are many manufactured homes located within Fountain of the Sun. These low-maintenance homes offer approximately 1,100 to 1,900 square feet of living space with two or three bedrooms, two bathrooms, and an attached garage or carport. The attached homes, also referred to as patio homes, are single-level townhomes. There are many affordable attached homes that range from approximately less than 1,000 to 1,500 square feet in size. Most of these homes offer one to two bedrooms, one to two bathrooms, and an attached garage. The single-family homes in Fountain of the Sun are a great option for homebuyers looking for extra privacy. These homes range from approximately 1,220 to 2,100 square feet in size. The single-family homes offer two or three bedrooms, two to three bathrooms, and an attached garage. We've lived here going on 5 years and really enjoy it. Both my husband and I taken on some new hobbies and are very active in the community. There are so many things we enjoy doing here it's hard to list them all. Golf, poker, horseshoes, scrabble, bridge, ceramics, we are very busy! We also get a lot of use out of the gym and the swimming pool. Everything here is great! 55places.com is not affiliated with the developer(s) or homeowners association of Fountain of the Sun. The information you submit is distributed to a 55places.com Partner Agent, who is a licensed real estate agent. The information regarding Fountain of the Sun has not been verified or approved by the developer or homeowners association. Please verify all information prior to purchasing. 55places.com is not responsible for any errors regarding the information displayed on this website.